We have always thought that Virginia is the most romantic place around, and now we have proof to back it up! According to Amazon’s list of the Top 20 Most Romantic Cities in the U.S., Alexandria is the most romantic city in the country. The large-scale retail company compiles data from their website’s sales of romantic items to create this annual list. Check out what makes Alexandria so romantic to us and explore ten other destinations that know how to set the mood. Close to the nation’s capital, Alexandria has scenic waterfronts, impressive fine dining, historic monuments, and some of the most luxurious lodging options in Virginia. If you are looking for romance, stroll the streets of Alexandria with your loved one and see why Amazon named it the most romantic city in the U.S. for the fifth year. ~ Morrison House is a romantic, small hotel with big acknowledgements: Mobil four-star and AAA Four Diamond. ~ Lorien Hotel and Spa is a luxury boutique hotel that is sensibly sophisticated. Adjacent dining at BRABO by Robert Wiedmaier is a delight. OpenTable named Virginia Beach the most romantic city on their list of the Top 25 Most Romantic Cities in America for 2016. Enjoy a walk on the beach at sunset to see why the Virginia coastline is one of the most romantic places in the U.S.
~ Hilton Virginia Beach Oceanfront is home base for Salacia and is one of the most upscale resort hotels in Virginia Beach. Check out the Sky Bar, too. Although the town of Middleburg isn’t a bustling destination, it offers elegant resorts, scenic vineyards, and some much-needed peace and quiet to visitors looking for a romantic getaway. ~ Goodstone Inn sits in the midst of Virginia’s hunt country and offers a fine farm-to-table menu of French Country cuisine. The inn offers six distinctive dwellings. ~ Salamander Resort opened in August 2013 and can easily be described as lavishly luxurious. Shenandoah National Park covers a wide region of Virginia, but the beauty of this park made it a top destination on our list for couples looking for romance. ~Skyland is a resort in Shenandoah National Park that offers breathtakingly romantic views for guests. ~Whiteoak Canyon has six waterfalls with swimming holes at the bottom of each waterfall. Visitors looking for romance in the Northern Virginia area should plan a trip to Vienna. The region is brimming with romance throughout the year and has plenty of fine dining, five-star stays, and both indoor and outdoor activities for you and your sweet heart. ~ The Ritz-Carlton caters to your needs with a full service spa and upscale dining. ~Cafe Renaissance blends French with Italian and gives it a modern twist. ~Meadowlark Botanical Gardens is the perfect place to take your sweetheart on a scenic stroll. Livability offers a list of Top 10 Romantic Cities and this historic area of Virginia happens to sit at number four. Bordered to the West by the Blue Ridge Mountains, Charlottesville’s backdrop is the epitome of romance in Virginia. ~ Keswick Hall is a “country house hotel” with 48 rooms, and is part of the Southern Living Hotel Collection. Virginia’s capital city has history, luxury shopping, and critically acclaimed restaurants. Oh, and did we forget that Richmond also offers plenty of romance? ~The Jefferson Hotel is a historic luxury hotel in the heart of the city. ~Lemaire Restaurant is the romantic restaurant located inside the Jefferson Hotel. ~Maymont is a public landmark in Richmond that has a nature center, wildlife exhibits, Japanese gardens, and many more attractions open to the public year-round. ~Can Can Brasserie is a Parisian-style restaurant in the Carytown area of Richmond that serves delicious French cuisine, along with an impressive selection of wines and beers from around the globe. Washington is a secluded paradise where you can celebrate romance at the highest rated lodging in Virginia. Within this small town, you’ll find quality cuisine, luxury shopping, and plenty of charm that will make you fall in love all over again. ~Inn at Little Washington is AAA Five Diamond Winner, a Forbes Five Star Hotel, and a Relais & Châteaux member. ~Skyline Drive, a National Scenic Byway, is especially romantic during the autumn months. Drive through the region to see the bright colors of the fall foliage. One of the oldest settled areas in America, Williamsburg has a way of transporting you to simpler times without removing the modern conveniences of your life. ~Colonial Williamsburg explores the history of America through restored artifacts, buildings, and stories told by employees dressed in traditional colonial-era clothing. Orange is a charming town about a half hour northeast of Charlottesville, and like its nearby neighbor, there are plenty of romantic wineries in the region. Visit Orange for a quiet yet intimate stay at one of the inns or bed and breakfasts in the area. ~Montpelier is the historic home of James Madison. If you’re in southwest Virginia and looking for romance, there is no better place than Abingdon. This town offers stunning Virginia scenery, romantic bed and breakfasts, and plenty of outdoor activities for couples basking in love. 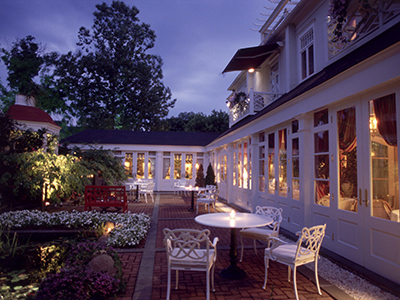 ~Martha Washington Inn & Spa is a four-star retreat that is full of romance and beauty. ~The Virginia Creeper Trail is great for those active couples looking for some outdoor adventure. Tell us, where is your favorite romantic spot in Virginia? I am sure you would want the most accurate information in your articles. I thought you should know, the beautiful scenery that you have shown for #8 is actually the Blue Rock Inn, also in Washington even though you have a different Inn listed. You missed the best places. How about the Shenandoah River? What could be more romantic than a picnic by one of the most beautiful rivers in the world? How about a romantic walk at Blandy Farm, the State Arboretum of Virginia, in the springtime when the buttercups are blooming, or in the summertime, when the meadow is bursting with wildflowers, or autumn, when the ginkgo trees show their vibrant yellow leaves. This is romantic, indeed. Who compiled this list? For sure your # 1 is not Romantic!!!!!!!! !